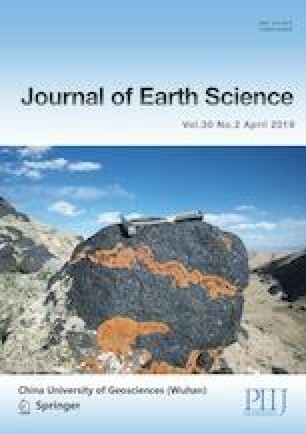 This paper presents zircon U-Pb-Hf isotopic compositions and whole-rock geochemical data for monzogranites and mafic-ultramafic complexes of the Maxingdawannan area in the western end of the east Kunlun orogenic belt, western China. The data are used to determine the ages, petrogenesis, magma sources, and geodynamic setting of the studied rocks. U-Pb zircon dating indicates that monzogranites and gabbros of the complexes were emplaced at 399 and 397 Ma, respectively. The monzogranites are shoshonitic, with high SiO 2, Al2O 3 and total-alkali contents, and low TFeO, MgO, TiO 2 and P2O5 contents. The mafic-ultramafic complexes are characterized by low SiO2 contents. The monzogranites display enrichment in light rare-earth elements (LREE) and large-ion lithophile elements (LILE), depletion in heavy REEs (HREE) and high-field-strength elements (HFSE), and negative Eu anomalies (Eu/Eu*=0.36–0.48). The mafic-ultramafic complexes are also enriched in LREEs and LILEs, and depleted in HREEs and HFSEs, with weak Eu anomalies (Eu/Eu*=0.84–1.16). Zircon εHf(t) values for the monzogranites and mafic-ultramafic complexes range from −6.68 to 1.11 and −1.81 to 6.29, with zircon model ages of 1 812–1 319 Ma (TDM2) and 1 087–769 Ma (TDM1), respectively. Hf isotopic data indicate that primary magmas of the monzogranites are originated from partial melting of ancient lower crust during the Paleo-Mesoproterozoic, with a juvenile-crust component. Primitive magmas of the mafic-ultramafic complexes are likely originated from a depleted-mantle source modified by slab-derived fluids and contaminated by crustal components. Geochemical data and the geological setting indicate that Devonian intrusions in the Maxingdawannan area are related to northward subduction of the Proto-Tethys oceanic lithosphere. Supplementary material is available for this article at https://doi.org/10.1007/s12583-018-1203-8 and is accessible for authorized users. We thank the staff of the Yanduzhongshi Geological Analysis Laboratories Ltd., Institute of Mineral Resources, Chinese Academy of Geological Sciences, for helping in the analysis. This work was supported by the National Natural Science Foundation of China (No. 41272093), and China Geological Survey (No. 12120114080901). The final publication is available at Springer via https://doi.org/10.1007/s12583-018-1203-8.